I formed the Drama Group and called the first meeting in November 1983 and staged the first play in February 1984 called No Time for Figleaves. This was a comedy when all the men on Earth have been wiped out leaving the women on their own, until two men are found deep underground on a special mission! Even with our first production, we lived up to the phrase “Break a Leg” literally, when one of the cast broke his ankle and in the third production the same member cracked a rib! We were originally based at Abbey Road Baptist Church and moved to the Abbey Centre with the Church, when it was built in December 1986 and that same month performed a short play, Christmas in the Market Place. The Abbey Centre was officially opened in January 1987 by Princess Diana, Princess of Wales, and she was introduced to some of the members. Since the start we have staged over 100 plays of all sorts ranging from comedies and farces to thrillers and serious drama, religious productions, and of course pantos which are presented every alternate year. The Group has the benefit of having a very good facility at The Abbey Centre with a good size stage, adequate rehearsal room, and good storage space for regularly used furniture and props. The group is an integral user of The Abbey Centre and will continue to support the work of the Centre’s Trustees. 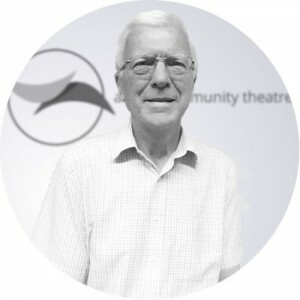 The Abbey Community Theatre will continue to maintain its place in the community it serves and in Amateur Drama in Northampton, and will present three plays a year of all sorts to as wide an audience as possible. If you’ve ever entered one of our interval raffle prize draws, then we offer our thanks to you for helping ACT to donate thousands of pounds to local charities over the years. Here are some of the recent letters of thanks we have received (click to enlarge).